Public Test Server for Paladins PTS 2.02, "End Times," is up soon, and, as always, we have a thread for you all to report any issues you find in our PTS build. Anything you see is helpful for us! Let us know what you find, and thank you all for participating in our Public Test! Reminder that the patch number for the current PTS is 2.2.3054.0. Note: You will need to download the Steam client to play PTS now. Instructions on how to do so will be posted below. - On the Paladins page, scroll down to the message that states "Note: Want to participate in the Paladins Public Test? Click here to install it now." Last edited by EvilMojoSrixis; 01-25-2019 at 09:23 PM. Mixer points are mis-labelled as chronoshards. 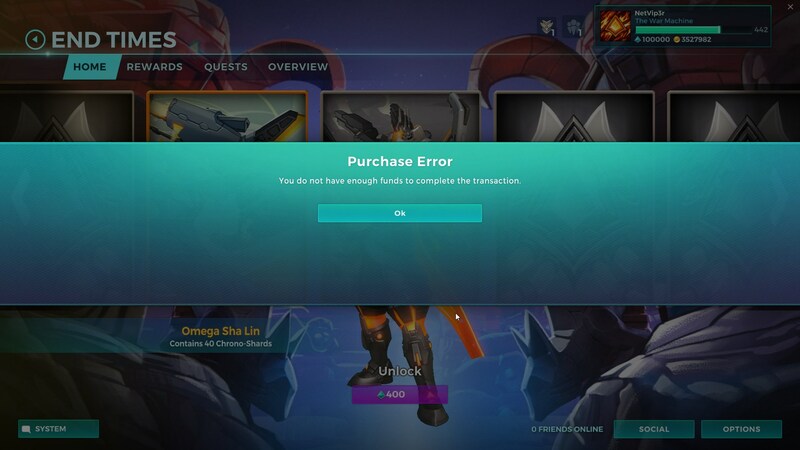 Unable to purchase anything with all the crystals that we are given. It says not enough funds. Can't buy anything with crystals. The announcer voice in "The end time" game mode( The tear is relocating) is echoing after match and during play of the game, and the voice is too loud. Last edited by NetVip3r; 01-26-2019 at 02:37 AM. Yeah, I also can't use the crystals to buy anything. I can use the gold I have, but not the crystals. Also, my Imani was at level 0 when I logged in, even though I purchased her last patch, and I didn't have battlepass this time around as well (I can't buy it for the second time, cuz the crystal issue, tho). Last edited by Onixy; 01-26-2019 at 03:12 AM. It says that HRX Digital Loot Pack is 25% off, or 600 crystals, but ir's not. It's 800. It says that Galaxy is 50%, there is not Galaxy chest in the Chests menu.